Science has moved to the forefront in the ongoing discussion of how agriculture can best protect water quality, but politics and angry activists have not disappeared. Legislators and public officials at two separate meetings recently heard about the state of the science from Cathann Kress, Ohio State University’s vice president for agricultural administration and dean of the College of Food, Agricultural, and Environmental Sciences. At an Ohio Soil and Water Conservation Commission subcommittee meeting, Kress said the effort to reduce farm runoff is “directionally correct.” She reiterated the complexity of the problem, saying that scientists have reached some conclusions but there remains much to be learned. Kress also restated the goal of balancing viable agriculture with water quality. The Ohio Soil and Water Conservation Commission subcommittee meeting was the first for the task force created when the full commission voted to not approve Gov. John Kasich’s executive order to declare eight northwest Ohio watersheds as distressed. The task force wants to better understand the science behind the declaration, which methods are most effective at controlling erosion and runoff, what roles manure and commercial fertilizers play, how government would enforce new rules and how the costs to government and farmers would be paid for. The task force also heard from Nikki Hawk, president of the Ohio Association of SWCD employees and district administrator for Mercer SWCD. Hawk, who was heavily engaged in the process to enact watershed in distress measures in the Grand Lake St. Marys watershed, cautioned against assuming what works in one place will work everywhere. She said the Grand Lake St. Marys measures are showing positive trends. But those results may not translate to areas Kasich wants declared in distress. The Grand Lake watershed is just over 59,000 acres compared to Kasich’s target of nearly 2 million acres. Hawk also pointed out that within an area that large, it would be difficult to craft one-size-fits-all solutions. While lawmakers, the commission and scientists seek crucial information, the Kasich administration has published draft rules for the proposed distressed areas. Ohio Farm Bureau has questioned the wisdom of trying to fix problems that aren’t fully understood. OFBF also has taken agriculture’s message to the public. Executive Vice President Adam Sharp appeared on Toledo’s WTOL TV’s The Leading Edge and Yvonne Lesicko, vice president of public policy, was on Bowling Green’s WBGU TV’s The Journal. Sharp and Lesicko shared farmers’ views and corrected misinformation. Another media event was far less positive. 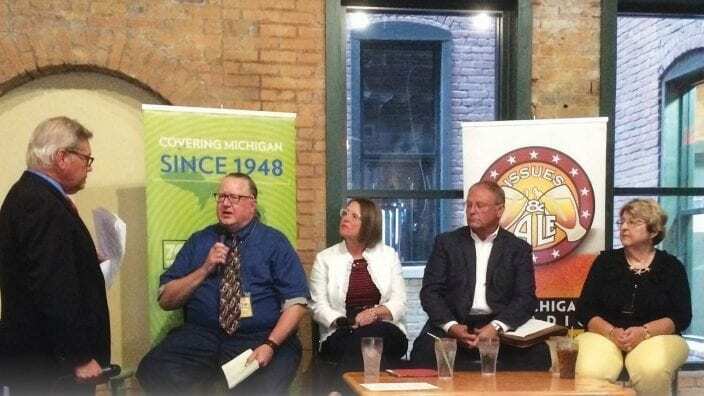 Lesicko appeared on a Michigan Public Radio station panel discussion (Featured image, in white). The event was recorded in front of an audience largely unfriendly to agriculture. There was little interest as Lesicko calmly and patiently explained farmers’ views and responded to inaccurate statements from other panelists. A small group of farmers in the audience witnessed both the animosity of the Toledo activists and Lesicko’s professionalism under fire. Fortunately, this event does not represent the majority of Ohioans who are concerned about water quality. Many want to understand the issues. Joe Cornely is senior director of corporate communications for Ohio Farm Bureau.